Perhaps you are looking for an idea for a story or poem or even a novel. Or you’ve run into a road block with the story you are working on, here’s an approach you might want to try. It’s called a prompt. I wasn’t always a writer who used prompts to kick my subconscious into gear. Once upon a time I waited on my unconscious to spit something out for a story or a poem or a novel. Since then I have reformed, realizing that I don’t have to wait. Prompts are a way to stir up the pot called my subconscious and put it to work, creating a new story whenever I want. There are all kinds of prompts. A prompt could be a line from a poem. It could be a word or a dream. It could be a situation. It could be a piece of music. My favorite kind of prompt is a visual prompt. A visual prompt is a photograph or a drawing or some other kind of visual stimulus. From that prompt my subconscious can fly until it lands on the beginnings of a scene or a story. Then all I have to do is let go and fly. Today I am posting a picture of a bridge in Paris as a Visual Prompt. A friend of mine took this photograph while she and her husband were in Paris for a vacation. I am not sure which bridge it is but the river is the Seine. The picture was taken sometime in September. That is all I know about the picture. When I first approach a prompt, I study the prompt for a while. 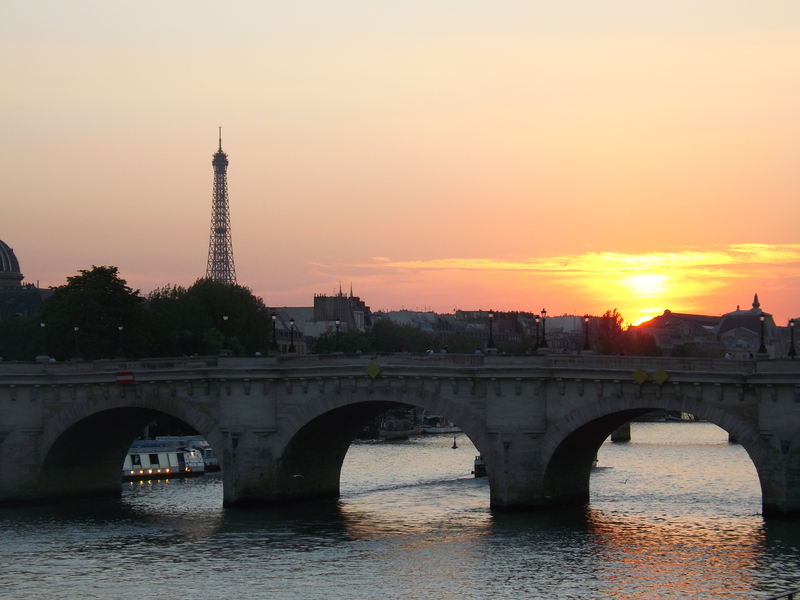 Things I can identify in this photograph: bridge, Seine, Eiffel Tower, sunset, a barge below the bridge on the river. QUESTION: Who is on this bridge? QUESTION: What is the Situation? What are the two women doing there? ANSWER: One is leaning over the side, looking out on the river, praying a rosary. I give her a name. Let’s call her Colette. She is French but speaks English well. The second is walking toward her. She is Rachel. She is American. Both have bright red hair. They are the same age, in their late twenties. Then I begin writing the scene, sketching it out, discovering things along the way. Example: Rachel was not happy. She had spent all afternoon waiting for Henri at the Eiffel Tower. I did not know that this until I wrote it. She fought back the tears. We are discovering something of the relationship between Rachel and Henri. He must have been a lover or a boy friend. The brown handbag she carried, strapped across her shoulder had been a gift from him for her twenty-eighth birthday. She remembered how delighted he had been when she opened the package. But now he had gone back to his old ways. Disappointed her. She walked fast, wanting to get away from the past and crossing the bridge over into the future. Then she stopped, pulled out her things in the handbag, her cosmetics’ case, her small wallet, leaned over the wall of the bridge and threw the handbag away. Colette acknowledged Rachel’s pain with a look on her face. She had been through the same thing and knew the feeling. Then she returned to watching the bauteaux-mouche below and to praying her rosary. Rachel handed Colette the mirror. She watched Colette look at her face in the mirror, then at Rachel’s. Surprise filled her face.They suddenly realized they were twins. Please realize that this is only a sketch of a first draft. As you can see, without doing much writing, I have already begun to discover the problem these two young women may have. How did a pair of twins end up in two separate places? WHO IS MY PROTAGONIST? Since I began with Rachel, she most likely will be my Protagonist. WHAT WILL BE MY POINT OF VIEW? I began writing in the third person from Rachel’s point of view. Since I have decided that Rachel is my Protagonist, she will probably provide the point of view. WHO WILL BE MY ANTAGONIST? Who will try to stop Rachel from discovering their family history? I could choose the mother. But what if the mother is dead? Maybe an aunt? A question arises here. Why does it have to be a woman? Could it be a man? However, as I am thinking this through and writing my scene, I realize that the Antagonist is Colette. What is her motivation? Only by continuing to write the scene(s) will I know that. Colette will reveal it through her dialogue and her actions. The answers to my questions is what will create the first draft of the story. “Damn you, Henri.” Rachel stood on the Pont Neuf bridge and threw her handbag into the Seine below. “You too?” The woman nearby asked. “What?” Rachel turned to the redhead. On another day, I might have chosen an old man looking at the Seine and thinking of his long lost love. Or an engineer inspecting the bridge. Or a gang of thugs. Or two lovers. It could even be Balzac on that bridge. Each would have his own story. Prompts are like that. They give the writer choices which the writer may never have thought of on their own. I have to trust my imagination and my subconscious to come up with a story or a poem that is just right for the moment. Writing stories is not a science. It is an art to be practiced. Prompts is a tool that can be helpful in practicing that art. So here is a Visual Prompt for you. See if you can start asking the questions of Who and What about the photo that could begin a story, then coming up with answers. Good luck.